Doing anything for thirty years is difficult, much less being in a band. Yet, the Melvins have done exactly that, carving a nice doom-rock niche for themselves. Not quite goth, metal, or punk, but infectiously weird, the band has developed a devoted following based on their work ethic. The Melvins Lite is off-shoot of the band’s regular line up: while Buzz Osborne remains on lead guitar and vocals, the regular rhythm section is replaced by Dale Crover on drums and Trevor Dunn on bass. Moving slightly away from their sludgy sound, this line up incorporates jazz elements like upright bass, brush drumming, and extended solo passages. The instrumental transitions between tracks are jarring and disjointed, giving this album a haphazard, tossed-off feel at first. Ironically, though, this becomes a unifying element of the album: an elegant metaphor of the bands out of control sound. They capture the sound of someone going mad, or losing whatever control he had left. This motif begins with “Mr. Rip Off,” which opens with haunted mansion cello strains blended with ghastly guitar feedback noise. The song then switches gears to a brisk jazz with upright bass and brush drumming, which leads into vibrated power chords reminiscent of Black Sabbath. This leads to more fluttering strings before the heavy riffing recommences. The song ends with sound effects, which sound like something you would hear on the demonic video in The Ring. If such diverse influences on a single track sound disarming, it might be because they are at first. The approach takes some getting used to with out a doubt. But by the time “Baby, Won’t You Weird Me Out” mixes Thin Lizzy riffing with cool cat jazz, you’ll be game for this album’s multifaceted treasures. “Worm Farm Waltz” has a chorus that might be lifted from a Rob Zombie song, which leads into a dissonant waltz section featuring droning cello and minimal drumming beneath eerily repetitive guitar lines. Seventies rock seems to be a big touchstone for this band, as “A Growing Disgust” shows. The song almost seems like a send up to “Strangle Hold” in its pacing and riff oriented approach to song writing. Particularly around the two minute mark, a fuzzy guitar solos over the distorted main guitars, and you’re convinced you’re listening to the Nuge. The band, however, isn’t into the business of delivering the expected: the violins begin to tremble over the steady riffing of the rest of the song, adding a creepy uncertainty to this otherwise straight-forward rocker. The band isn’t operating in just one vein of hard rock, either. “Holy Barbarians” glides out of the speakers like one of Sonic Youth’s mellower 80’s compositions. With swirling vocals and chorus-drenched guitars, this track seems like a love letter to the 80’s scene that bore the Melvins. Then the title track cracks out another bevy of diminished guitar riffs, and manages to recall the Cramps and AC/DC simultaneously in its vocals. But “Freak Puke,” too, ends with an unanticipated flourish—this time, in the form of scratches from a washboard. Their cover of “Let Me Roll It” is a similarly unpredictable turn for the record—yet also logical considering some of the other influences at play here. It helps that Osbourne sounds more like Danzig than Sir Paul, but all the vocals are slightly off from the original in creepy ways. The sing-along chorus features ghoulish background vocals, as if they held a séance in the studio just for this track. The cover ends with distorted guitar squalls bending and vibrating in an ominous fashion. The concluding “Tommy Goes Berserk,” however, is the most interesting departure of all. The song is structured like one of Mercury Rev’s epic classics. Accordingly, the band incorporates the violin most naturally on this track, seeming more like a component of the song’s structure then a tool of dissonance. By the time the distorted guitars kick in, the band has worked itself into a Canned Heat-like lather, and you’ll want to sashay around to the warbling licks. At the ending, the band incorporates some tape loop sound effects that recall “Revolution No. 9.” Unlike the important Beatles pastiche, however, the sounds at play here are so odd and off-the-wall, you might find yourself laughing. Such is the bands bizarre sense of humor, making the song an engrossing and fun listening adventure. 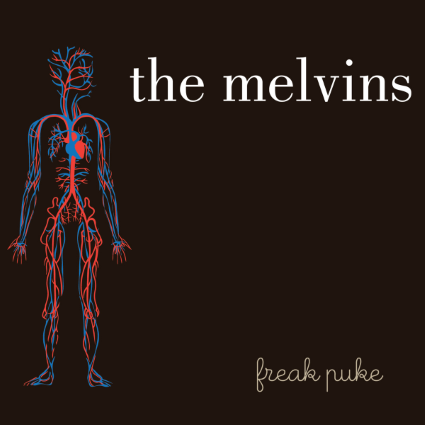 The whole album maintains this quirky sense of fun and shock over it’s entire run, and will not disappoint long time Melvins fans. While playing “name the influence” is lighthearted fun, it shouldn’t detract from the strength of the material herein. 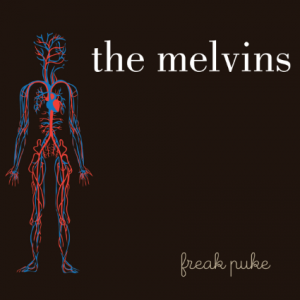 The main point of the Melvins is their kaleidoscopic eschewing of rock ‘n’ roll conventions, and their ability to carve unique and intriguing new sounds out of familiar components. This album delivers exactly that with gusto.